Couldn’t you use a little control? What if you could have flexible, set-and-forget control over the environment in your building without the expense of a large building automation system? Well, now you can, with the KMC FlexStat. What is FlexStat? 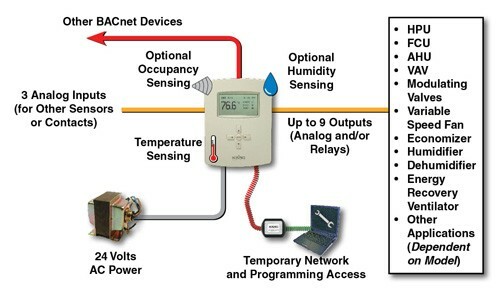 First, it’s a programmable thermostat with optional humidity and occupancy sensing. 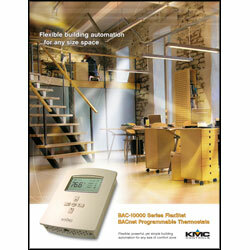 Second, it’s a native BACnet Advanced Application Controllers (B-AAC) for connection to a BACnet system. The FlexStat simplifies networked, zone control for common packaged HVAC equipment, such as packaged rooftop units, fan coil units, heat pumps, and similar applications. In addition, applications such as pressure-dependent VAV, terminal reheat, and medium-sized central station air handling equipment applications may also be addressed through the on-board libraries of programs built into the device. The on-board library of programs permits rapid configuration of a wide range of HVAC control applications and (using BACstage™ or TotalControl™) can be edited or replaced with custom programming.